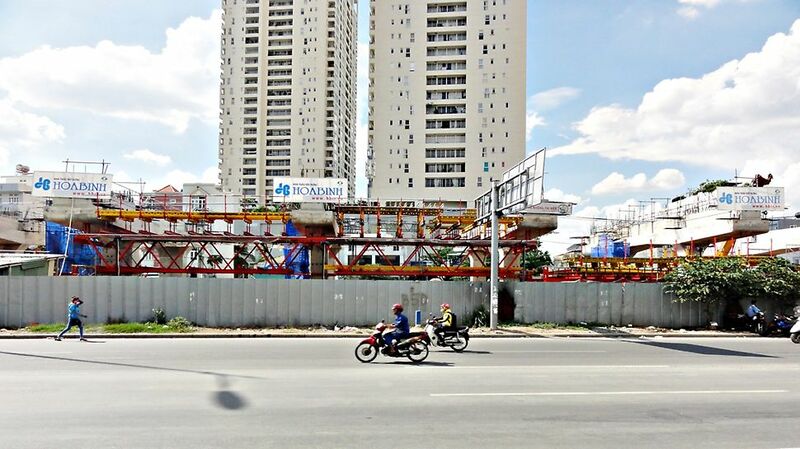 Forming the concrete levels without shoring to the ground for construction of several of the elevated stations in order to protect the existing water pipes along Xa Lo Ha Noi highway with diameters up to 2.4m. Each bay of the station has a width of 12.5m and an approximate clear height to the concourse level of 4.5m. Main contractor: SUMITOMO -CIENCO 6 Corp.
PERI Customer: LOTUS Greentech Co.
Field Service: PERI Asia PTE LTD.
PERI has provided us with good products and a customized solution to meet our technical requirements. Besides that, we are satisfied with the engineering support and formwork supervision at the jobsite. Customized VARIOKIT Trusses are suspended from the pier caps by four DW26 tie rods to support a maximum load of 50 tones without any shoring to the ground. MULTIFLEX Girder Slab Formwork with MULTIPROP shores are being applied for forming the slab.